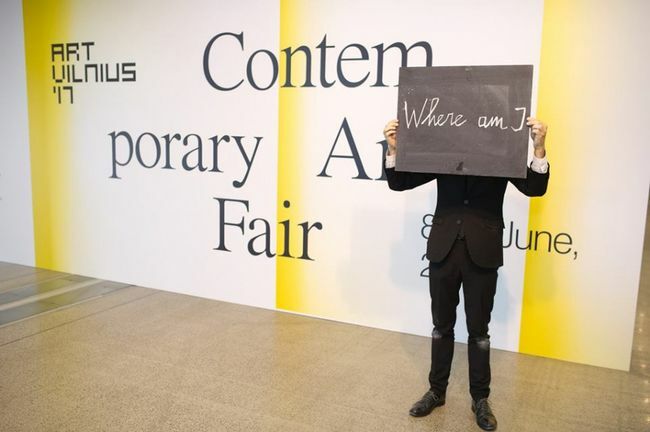 ArtVilnius is the only contemporary art fair in Lithuania and the largest art fair in Eastern Europe. ArtVilnius was first held in 2009, when it was one of the most important events in the “Vilnius – European Capital of Culture” project. Over the past eight years the art fair has expanded and become firmly established on the local and international art scene, as well as on the list of must-visit events for art lovers. This is also confirmed by statistics. Every year ArtVilnius receives over 20,000 visitors, with about 60 art galleries from dozens of countries participating (Belgium, Germany, Estona, Latvia, Poland, Ukraine, Lithuania, Belarus, the Netherlands, Italy, France, et al.). Applications are examined by a jury consisting of art critics and experts, which ensures professionalism of the galleries at the fair. The main objectives of ArtVilnius are not limited to stimulating the art market in Eastern Europe, as well as presenting the panorama of contemporary art trends. The fair’s organizers have integrated Vilnius into a system of the most important centers of contemporary art in Europe and helped it become a bridge between East and West. ArtVilnius is held annually in one of the best exhibition spaces in Lithuania – LITEXPO Exhibition and Congress Centre. This 12,000 sq. m. exposition space makes it possible to hold all the necessary events. The fair’s architecture has been repeatedly altered in the past few years by a team of architects. Last year ArtVilnius presented some of the best-known Polish art institutions (Krakow Museum of Contemporary Art and Center of Contemporary Art in Gdansk), as well as a program of contemporary video art, featuring VIDEONALE (Germany), one of the oldest video art festivals in Europe. The fair also comprised Takas (“Road”), a unique annual show of sculptures and installations, in which artists from Lithuanian, Latvia, Ukraine, the Netherlands, Poland, Portugal, Germany, Denmark, and elsewhere display their works. Selecting the best gallery, artist, and works has become a traditional part of the program. A committee of art critics chooses winners in the following five categories: Best Artist, Best Gallery, Best Foreign Gallery, Best Installation, and Best Young Artist. In addition, visitors to the fair can vote for the artist and gallery they like the best. A sponsors’ cash prize is awarded to the best young artist. ArtVilnius is organized by the Lithuanian Art Gallerists’ Association with Diana Stomiene at the head, who is also director of the fair. We met Ms. Stomiene at the recent Kyiv Art Week festival in the “Uzupis” section that focuses on Lithuanian artists. Diana, how did ArtVilnius come about? I was going to ask about money in the next question. How did ArtVinius vary in the course of time? But how did you picture all this in the beginning? I know that Ukraine was the fair’s theme in 2015. How did it occur to you? Are there your favorite artists and galleries here in Ukraine? The hall we are in now is called “Uzupis.” Whence is this name? “We are now focused on the Baltic region because Lithuania, Estonia, and Latvia celebrated the 100th anniversary of the restoration of independence. Next year we will hold the 10th fair focused on France. We have a lot of our well-wishers there. Of course, we will go off the limits of the LITEXPO palace. For there are also the Contemporary Art Center and the National Gallery in Vilnius, and we will get them involved, too. Besides, we will hold ‘The Night of Galleries.’ We have a lot of guides now. We must make efforts. People used to keep aside, for they had economic problems. But now everything is stable, and one must fill new niches. If done in good time, this will increase the number of collectors and fans. Incidentally, it is good that Kyivites are aware of this, although I know that the situation is more difficult here. State guarantees are important here. It follows from what you are saying that ArtVilnius is now an important component of city life. Do you have a hobby apart from art management?